Hmmm, doesn't look like they are going to have it all done in 10 days to me. 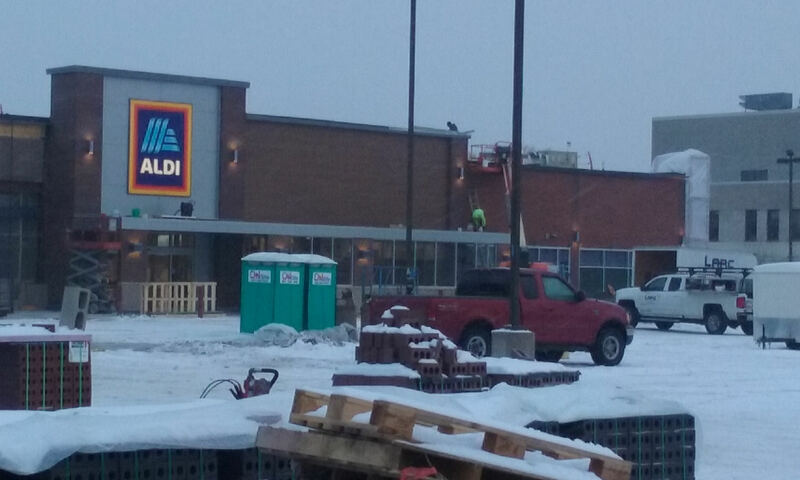 Aldi is supposed to be open for business on 12/13? I guess if they have the inside done already, they will just have the outside to finish and clean up. Have you seen where the deliveries will be made? I haven't noticed any docks. Walked past it this morning on the way to work, the inside looks basically done from what I could see, (looks pretty nice in there actually) and it looks like they put the signs up on the exterior yesterday both on the building and on top of the streetside sign above the wendy's one. TBH it looks like all they really have left is smaller stuff, cleaning up the construction on the left half of the building and maybe some parking lot work like repaving it if they are planning to do that. I'm not sure if there's something going in the left half at the same time so that part doesn't look done since it's all covered up in plastic wrap at the moment but the ALDI half looks basically all good to go. When I was coming home from work yesterday it looked like the property owners were touring around with the construction crew. So the official opening is tomorrow but the ALDI was open today for kind of a preview day for the neighbors. Place looks fantastic. 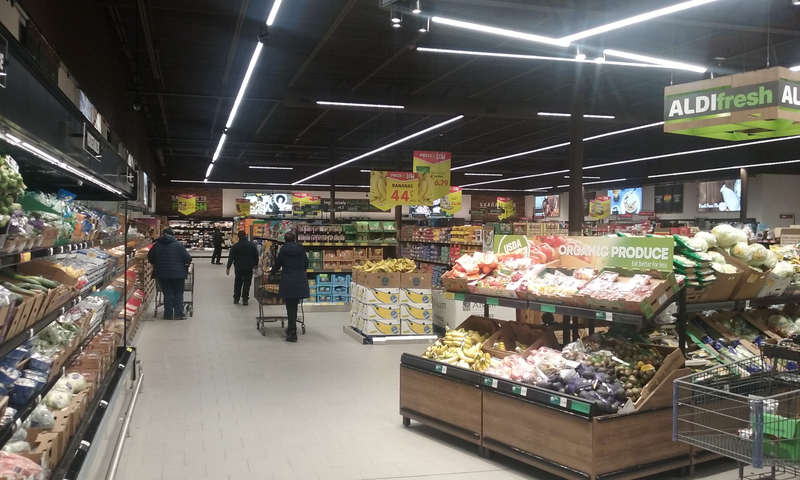 Different interior layout/design compared to the other ALDI's around the town. Lot more modern and bright. Layout is actually somewhat similar to your typical supermarket with the produce all towards the entrance and along the side wall and such. Almost feels kinda like a Trader Joe's (which I guess makes sense since ALDI owns them). I feel so spoiled having it literally a block away. I think I've only been to an Aldi's once. How is their quality? Get what you pay for? They honestly are pretty decent. Never had any issues personally with any of their produce/meat etc compared to what I would get at a Cub. I particularly love getting gallons of milk for under 2 bucks, which seems like a much more sensible price than the usual rate. The nice thing about this new one is that the selection is a lot larger than your regular ALDI since the space is bigger. Here's a pic from just a little ways in from the door. The layout is different from your usual ALDI as well. It doesn't start you out trapped in a dry goods aisle until you get to the end of it by the coolers and can get to the rest. It's all more open and kinda like your usual supermarket. My wife and I used to go to the other ALDI across Hiawatha from time to time when we wanted to deal with parking and this new one has like...twice the selection. TBH I won't be suprised if my wife and I do most of our shopping here going forward. We always liked the prices at ALDI and now it's ridiculously convenient. We'll probably only go to Cub if we need some kind of specialty thing that ALDI doesn't have but for general week to week things I think we're pretty well covered and will save a lot. Aldi (which owns TJ's) and Aldi Süd is kind of like Fleet Farm vs. Farm and Fleet. Although FF was never a single entity as Aldi once was. I think Aldi is great. It's the same 'sell our own label' model as TJ's with less organics and cheaper costs. Just bring your own bags and coins for a cart. I don't quite understand the excitement about Aldi. I think it revolves around getting commodity food products for the lowest possible price. Is this correct? It's the price, but also the ease of shopping. ALDI's don't have a bunch of different brands of each thing. Most of it is all their particular store brands with a few rotating name brand things here and there. So instead of going to your usual grocery store and deciding between 17 brands of ketchup and such you go down the aisles and there is just one brand of everything. Much easier and quicker shopping because the stores take up less space and you don't have to decide. For busier people, and especially people trying feed kids on a budget ALDI's works really great for them since it costs less and the shopping experience is so fast. Oh, and I forgot to note that ALDI also pays its employees a decent wage compared to other grocery stores. IIRC cashiers start out at around $14/hr or something and if you're a shift manager you're getting $18-$20 ish an hour. Not bad for grocery. I'd much rather support that over Cub which seems to start people out around $9-$10 an hour. And some (most?) Cub stores are unionized. The Hi-Lake Cub is a union shop. A bit off topic, but unions are great when they bring increased wages, better benefits, a stable and well trained workforce and improved accountability on both sides. Unions are unnecessary when employers offer the wages and benefits on their own. It sounds like Aldi already offers more than Cub to it's employees, though I have not looked into it. Article about the new brewery taking over the old Harriet space. Oh good that's finally getting done. I was starting to wonder if something happened since it had been coming soon for quite a long time. Kind of makes on wonder why Harriet ended up closing then. The word was that the block was going to be redeveloped. I don't think Harriet had much margin for error since they weren't distributing at all. They certainly had let the place go in the last year or so. None the less, this is great to see. This myth that distribution is the be-all-end-all for taprooms is baffling. The margin on product sold in-house is so much higher than product distributed. And fighting for taps in the crowded market is cut-throat. So much easier to cultivate a niche and serve an ultra local market. My read on Harriet was that it was a fun adventure for the founders, but their hearts just weren't in it. Harriet also never really nailed the beer, the quality of which seemed to vary batch-to-batch.